In March of 2007, I took a trip to central Mexico with three friends, a pick-up truck, and a trailer full of supplies. We were part of a small missions team working with By His Hands Ministries to join forces with missionaries and pastors in Piedras Negras, Mexico for a week of ministry to local churches and to the poor. 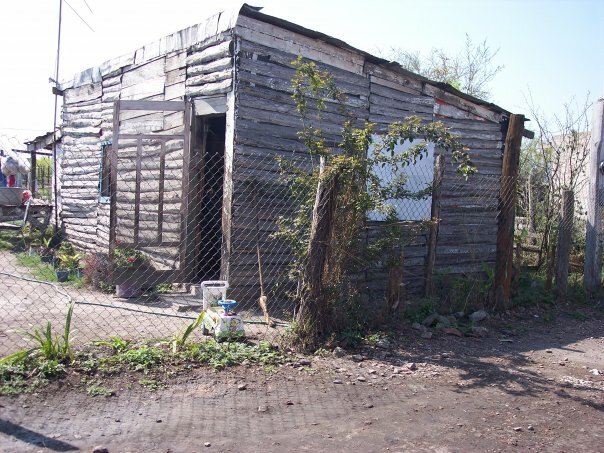 I found Piedras Negras to be a place where my pride melted away and where people were forced to be dependent, and where their needs were so easily seen that their vulnerability couldn't be hidden with a suit. A place where love was generous, but things were few. A place where I found God's greatness in piles of burning trash and make-shift shacks. I had never seen poverty in its truest form, until i went on this trip. I was not totally prepared for the things that I saw, and was very surprised by what I discovered about having literally nothing. I had a few run-ins in my life with homeless folks and people living in extremely poor conditions in the United States previous to this trip, but none of them came relatively close to what I saw in Mexico. On the first day of our trip we drove into Musqiz, past the second Mexican border and stayed with a pastor and his family there. The next morning, he woke us up and told us that we were going to visit a local community. This place was nothing but ramshackle huts constructed with whatever these people found from the garbage heaps behind their homes. We stopped to speak to a man standing outside drying clothes by a fire and cooking a pot of beans. I don't know what the pastor said to them, but the woman (probably his wife) looked at us and said that they were happy and that the beans were like pork chops to them. They were so grateful for what they did have, that it felt like more than they could have imagined. I was so touched by their gratitude and positive attitude. The woman said they were so grateful for that pot of beans that it was like pork chops to them. We kept driving and eventually came to the garbage heaps behind the shacks where trash was being burned and toxic chemicals filled the air. There were men, women, children, and cows rustling through the heaps of trash looking for clothes and food. We met a little boy name Havier. He was as happy as he could be. He was there with his mom, and just running around playing like at normal child. He has such a big smile. I couldn't help but wonder how he could smile in the midst of all this. Did he understand what he didn't have? Men, woman, and children were digging through piles of burning trash, releasing toxic chemicals into the air. There were also cows, crows, and dogs walking through the trash looking for food. This happiness in the midst of extreme poverty (in some places, third world conditions) seemed to be a running theme of the whole week. Everywhere we went we were fed, loved on, prayed for, encouraged, smiled at, and welcomed warmly. These people didn't have two pennies to rub together, yet wanted to give us anything they could. The breaking point was when we went to "the tracks. " This is a place where the Mexican government allows the homeless to live. 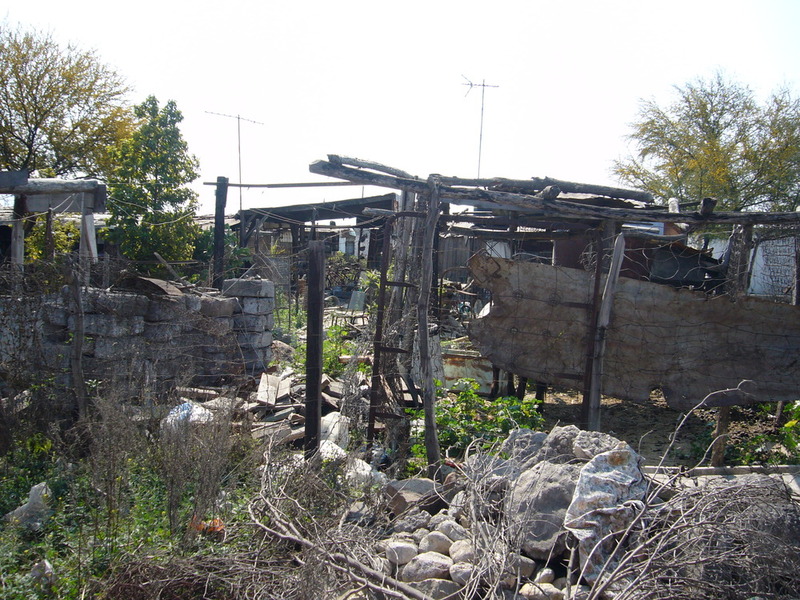 It is a poor community built along the sides of speed train railroad tracks. It is a dangerous place namely because of the speed trains, but even during the day, female members of our group could not walk around by themselves. Our group went there to bring supplies and visit a woman in that community named Irma. She is by far the most amazing woman I have ever had the pleasure to meet. She is a woman in her 40's who came to the Lord about 3 years ago. She opened up her home to the children who live on the tracks. It is a school/soup kitchen that her and her daughter run where the children come each day to be fed and to learn about God. She has no prior ministry experience. She has no financial backing, no 501(c)(3), and no seminary degree. She is simply living a life of obedience to God and serves these children day in and day out by providing a safe place for them to learn, play, and have a meal. I had such an amazing connection with Irma even though i had no idea what she was saying most of the time. The interpreter helped me to ask her about her testimony which was completely amazing. She reminds me of a female version of the apostle Paul. Her life was completely turned around and God immediately opened the door for her to minister full-time. She is rich is compassion and in character. I was truly touched by the warmth and generosity of these people, who literally had nothing, but on the inside I was battling. I really had to question God. How could this be? These children living in such a dirty, depressing, dangerous place with little hope for life outside of this forsaken community. Where was God in this? This was a struggle for me. It's a struggle for many Americans. We are used to a certain way of life. There are certain things we feel we have the right to have. But those things don't make us happy. They don't fulfill our deepest desires. So, how do we engage? How do we approach this problem? How to we provide and care for the less fortunate and not simply fill their lives with things, or simply alleviate our own guilt? The Lord showed me something different than what I would have expected. First of all, He showed me His greatness in that, despite these terrible circumstances, He was at work and these people had passion and heart and true generosity. These things couldn't be reproduced or faked or forced. It has to come from the heart and the heart is what God looks at. Second, the Lord cares enough to call people like our group, and like the pastors we traveled with, to care for these people and to make others aware of the need. There is much work to be done, but the work has begun and that's something. So how do we engage with the poor? In DC, I see homeless people all the time. We all do. They are sitting on corners shaking plastic cups full of change or holding signs at stop lights. We have put up walls. Seeing these people has become the norm on some levels. We have learned to just walk by and ignore them. Its easy to lose a sense of compassion when you feel like people just want a handout or they have no motivation to try to get on their own feet. What I would like to accomplish with this topic is to get us to look at some short-term and long-term solutions to fix and reform the issue of poverty. Next week, I will write about what some organizations are doing to help the poor learn sustainable living habits that will help solve long-term problems. This week, I want to focus on the short-term needs of food, shelter, and clothing. There were immediate needs that we were able to meet on that trip, through the supplies that we brought with us and purchased for others while in Mexico. There were issues with food and water that we were able to meet immediately through giving to the poor and caring about their present needs in the moment. These folks live day to day, meal to meal. While we want to explore ways to help them to sustain themselves long-term, the first layer of engaging with the poor is a response to the immediate and pressing needs of these people groups. Today, I want to introduce you to an organization that I trust and admire for their great work in this regard. 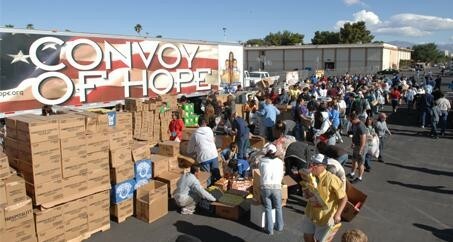 As first responders to many disasters, like hurricane Katrina, and the ability within the organization to pin point and tackle the poorest and most extreme situations, Convoy of Hope has been an organization whose faithful service to mankind has produced much long-term fruit. Convoy of Hope is a faith-based, international, humanitarian-relief organization out of Springfield, Missouri that operates with the goal of bringing help and hope to those who are impoverished, hungry, and hurting. Nationally, this organization reaches communities through providing groceries, health and dental screenings, haircuts, family portraits, hot meals, and job-placement assistance. Convoy of Hope works with churches in rural areas to help train and mentor them to reach out to their respective communities. They are consistently among the first to respond to disasters throughout the world and are equipped with disaster response teams, six international warehouses, and a Mobile Command Center. Internationally, they have provided meals for 145, 000 children in 11 different countries. These food distribution opportunities have helped open doors for education, clean water, and spreading hope. Convoy of Hope accomplishes this through monetary support and sponsorships, and by partnering with other like-minded organizations. To learn more about Convoy of Hope, their work around the globe, and to find out how to join forces with them, click here. Convoy of Hope, among many wonderful and noteworthy organizations, are leading the fight against global poverty by responding to the pressing and immediate needs of the poor. Please feel free to comment on this post and tell us about other organizations you know of or work with that are leading the fight against poverty. Next week, I will continue to focus on the issue of global poverty from the perspective of identifying and supporting long-term solutions, such as micro-financing, to combat the cycles of poverty that many people struggle to crawl out of. We don't simply want to put a bandaid on poverty or enable these cycles to continue, so we will look at some organizations that are doing a stellar job getting individuals and families on their feet for the long-term.